Directions (Q. 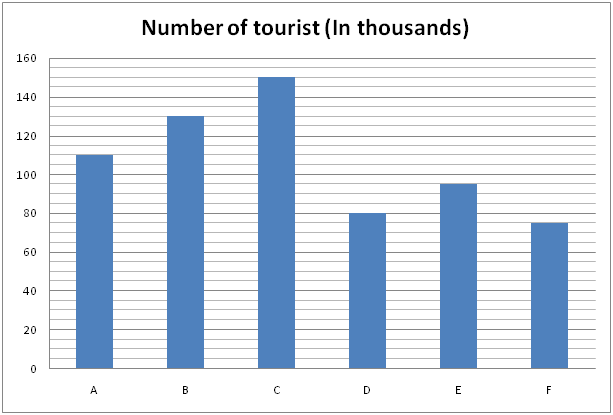 6 – 10) Study the following information carefully and answer the given questions: The following bar graph shows the number of tourist (in thousands) visited six different places in India in the year 2017 and the table shows the percentage of men, women and children’s among them. 7. Total number of women and children’s who are all visited the city A and D together is approximately what percentage more/less than the total number of men and children’s who are all visited the city B and E together? 8. Find the difference between the total number of men who are all visited the city B, C and F together to that of total number of women who are all visited the city A, D and E together? 9. Find the ratio between the total number of men to that of children’s who are all visited all the given cities together? 10. Total number of people who visited the city A, B and E together is approximately what percentage of the total number of people who visited the city C, D and F together? 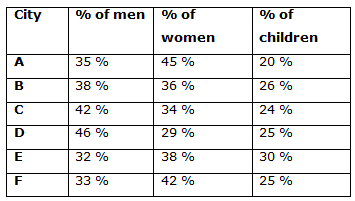 The following bar graph shows the number of tourist (in thousands) visited six different places in India in the year 2017 and the table shows the percentage of men, women and children’s among them. 7) Total number of women and children’s who are all visited the city A and D together is approximately what percentage more/less than the total number of men and children’s who are all visited the city B and E together? 8) Find the difference between the total number of men who are all visited the city B, C and F together to that of total number of women who are all visited the city A, D and E together? 9) Find the ratio between the total number of men to that of children’s who are all visited all the given cities together? 10) Total number of people who visited the city A, B and E together is approximately what percentage of the total number of people who visited the city C, D and F together?